I have headlights on the cab like most real machines have. In addition, I have colored the grilles of the doors in black so it looks more like there are cavities in the doors like the real machine. I replaced the original tracks with wider ones so that they are 800mm track plates, like many machines in Belgium and the Netherlands. Because the original buckets with pin fastening are rare in Europe, I went looking for an alternative. I would like to have a CW quick change on the SK210LC and on the SK140SRLC. As these do not exist in miniature, I started drawing on the computer myself and I drew a quick change and a lot of different containers including sorting grab in 1:50. I had these printed out with shapeways. 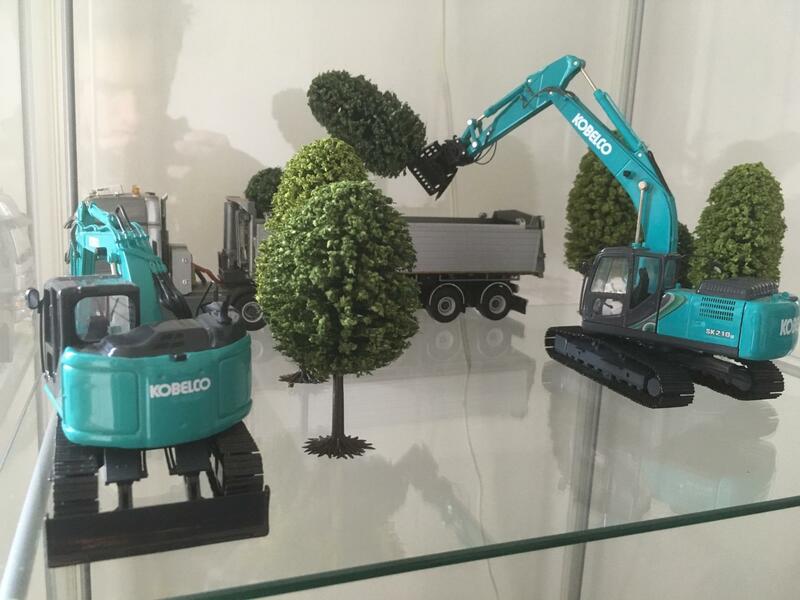 I have painted the quick couplers and mounted them on both Kobelco's. You can see the result on the photos. The sorting grab has been fitted with pipes that connect to the original auxiliary hydraulic circuit of the sk210lc. On the pictures you see that I put both models in a mini diorama. 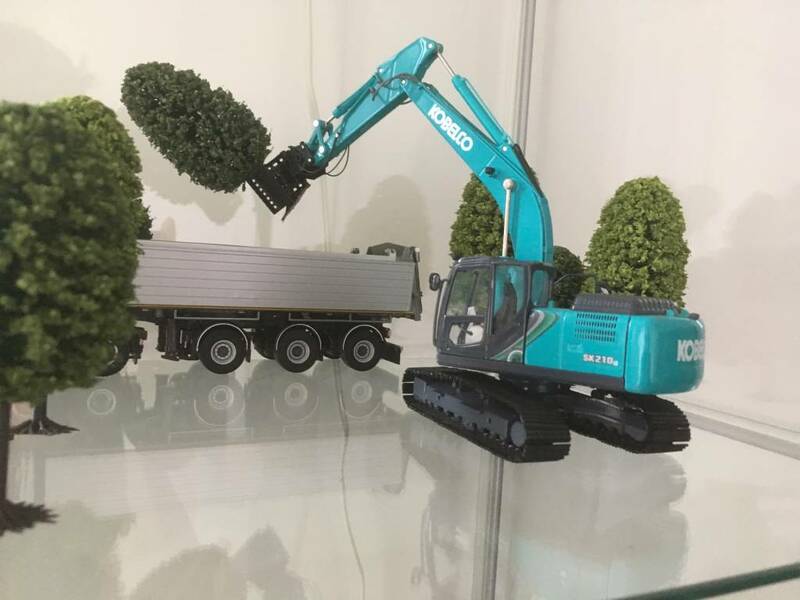 I bought the trees in a miniature shop. I also added a truck with a trailer for the removal of the trees. The SK140SRLC-5 is digging a slot in a small corner, the compactness of the SK140SRLC-5 is perfect! I hope you find it fun and interesting. **Due to demand the SK210LC scale model is sold out! Yes we are due more SK210 stock in March. Delayed due to Chinese New Year. Hi, will you be getting any more SK210LC models back into stock? Many thanks. Glad you like it. If you have any photos of your machines, please send them to us. The SK210LC scale model has just sold out! We expect stock of that one in a few weeks.